Liverpool have both taken (135) and scored (103) more penalties than any other side in Premier League history. Jurgen Klopp picked up his first league win at Anfield as James Milner's second-half penalty gave Liverpool the points in a stale game against Swansea. Milner converted after Swans full-back Neil Taylor was penalised for handball. Liverpool - so impressive in their win at Manchester City last week - were flat for large periods but did see captain Jordan Henderson return from injury as a substitute. Swansea have now won once in 10 league games since August. Garry Monk's side failed to record a single effort on target in 90 minutes and face the top two in Leicester and Manchester City in their next two games. Klopp's Reds struggling for style at home? Liverpool's last two Premier League games away from home have seen them record hugely impressive wins at champions Chelsea and leaders Manchester City, with Klopp's preferred 'gegenpressing' style well suited to winning the ball back quickly and hurting teams on the break. But in three league games at home, the Reds have scored just three times under Klopp and remain a work in progress. Despite a bright opening spell, during which Jordon Ibe forced defender Kyle Bartley to clear against his own post, the hosts soon ran out of steam and did not have an effort on target until the 52nd minute, when Ibe's tame shot was saved by Lukas Fabianski. In truth, they were grateful to referee's assistant Simon Beck for the decisive moment when he awarded a penalty as Taylor blocked an Ibe cross with his arm. 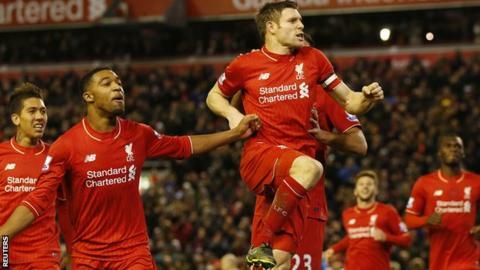 Milner lifted the spot-kick high into the net to give Liverpool a sixth win in seven games in all competitions, which lifted them up to sixth in the table. With former captain Steven Gerrard watching from the stands, perhaps the biggest plusses Liverpool fans can take from the win are the returns of Henderson and Daniel Sturridge. Henderson - missing with a broken foot since the second game of the season in August - was handed the armband when he came on for the final 25 minutes, while Sturridge had a 19-minute run out for his first appearance since Klopp replaced Brendan Rodgers in October. Garry Monk said his side were 'excellent' but only three of his players had an average position inside the Liverpool half. Wayne Routledge (15) was the furthest forward. If Liverpool looked uninspiring in attack, Swansea's failure to test Simon Mignolet at all will give manager Monk plenty to ponder. More worryingly it was the second time in the last three Premier League matches that Swansea failed to hit a single effort on target - also registering no attempts in the 1-0 defeat at Norwich. Monk - who took charge in February 2014 - guided Swansea to their highest Premier League finish of eighth last season. When they beat Manchester United at the end of August the Swans were in fourth but they have won only once since, scoring seven goals in 10 matches. Monk can point to a harsh handball decision which settled the game but, in attack, his side offered precious little threat. Centre-forward Eder was often isolated and replacement Bafetimbi Gomis has lost the spark which saw him score in each of the opening four games of the season. With testing games against Leicester and Manchester City to come a four-point gap to the relegation zone is a real concern. Liverpool manager Jurgen Klopp told BBC Sport: "It was really difficult for both teams, the wind was in the stadium more than the stands. "Swansea defended very well. They had some problems in the last few games but they were more compact. I am proud of the lads. It is a good result in difficult circumstances." Emre Can (right) was at the heart of Liverpool's bright start in midfield and had the most touches (99) of any Liverpool player. Liverpool face a trip to Southampton on Wednesday for a League Cup quarter-final, before facing Newcastle at St James' Park next Sunday. Life does not get easier for Swansea as they host Jamie Vardy's Leicester next Saturday, and then travel to leaders Manchester City the week after. Match ends, Liverpool 1, Swansea City 0. Second Half ends, Liverpool 1, Swansea City 0. Corner, Swansea City. Conceded by Kolo Touré. Substitution, Liverpool. Kolo Touré replaces Jordon Ibe. Corner, Swansea City. Conceded by Emre Can. Attempt blocked. Bafétimbi Gomis (Swansea City) right footed shot from outside the box is blocked. Assisted by Ashley Williams. Corner, Liverpool. Conceded by Kyle Bartley. Jordon Ibe (Liverpool) wins a free kick in the attacking half. Corner, Swansea City. Conceded by Nathaniel Clyne. Delay in match Kyle Bartley (Swansea City) because of an injury. Attempt missed. Ashley Williams (Swansea City) header from the centre of the box misses to the right following a corner. Corner, Swansea City. Conceded by Martin Skrtel. Attempt blocked. Bafétimbi Gomis (Swansea City) right footed shot from the right side of the box is blocked. Assisted by André Ayew. Attempt blocked. Jefferson Montero (Swansea City) right footed shot from outside the box is blocked. Assisted by Bafétimbi Gomis. André Ayew (Swansea City) wins a free kick in the defensive half. Attempt missed. James Milner (Liverpool) left footed shot from the left side of the box misses to the right. Assisted by Jordan Henderson. Substitution, Liverpool. Daniel Sturridge replaces Christian Benteke. Substitution, Swansea City. Bafétimbi Gomis replaces Eder because of an injury. Delay in match Eder (Swansea City) because of an injury. Eder (Swansea City) wins a free kick on the left wing. Substitution, Swansea City. Jack Cork replaces Leon Britton. Substitution, Liverpool. Jordan Henderson replaces Roberto Firmino. Goal! Liverpool 1, Swansea City 0. James Milner (Liverpool) converts the penalty with a right footed shot to the high centre of the goal. Penalty conceded by Neil Taylor (Swansea City) with a hand ball in the penalty area.